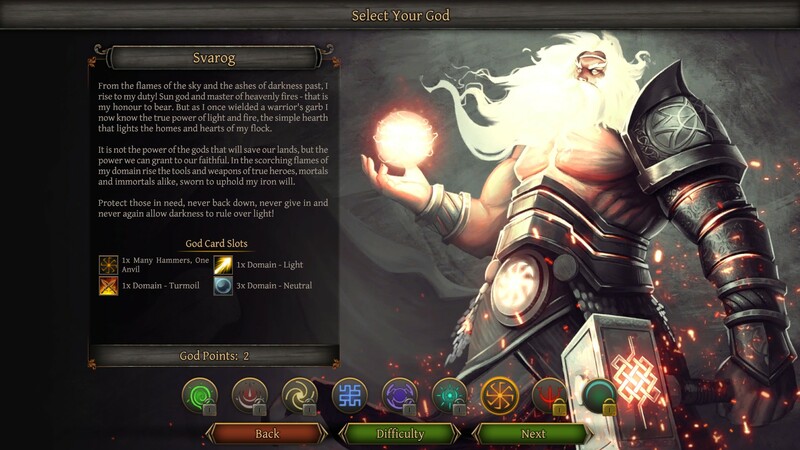 Thea 2: The Shattering is an innovative blend of 4X strategy, RPG, and card games, where you need to guide your people to survive in dark lands inspired by Slavic myth. This game is still in Early Access, and is currently only available for PC. Thea 2: The Shattering is a sequel to Thea: The Awakening, which was released in 2015, and has received a lot of awards and favorable reviews. Both of these games have been developed and released by the indie game studio MuHa Games. In Thea 2, most of the story unfolds as you play the game. At the very beginning, you can only choose your god. Afterward, you’ll get a short introduction of the world and the game mechanics by a friendly demon, explaining you can either aim to build a village, or live like a nomad. After you’ve walked around a little bit and gathered some resources, you’ve most likely had some events happen to you which explain the workings of this world a whole lot better. Most of the story is being told in dialogues of random events, which happen quite frequently. At the start, you’ll only know very little, but you’ll learn as you go along. This might cause some confusion at the beginning, but you’ll get the hang of the game soon enough. Meanwhile. you’ll get curious about the creatures and gods of the setting of the game. The graphics look pretty good; the world map you’ll explore is detailed and animated, and the hour of the day is very well represented by the lighting of the world. The UI is clear, but a bit overwhelming at the very start of the game. Not all UI elements are well-explained or otherwise obvious, but since the game is still in early access, it is likely some tooltips will be added later. 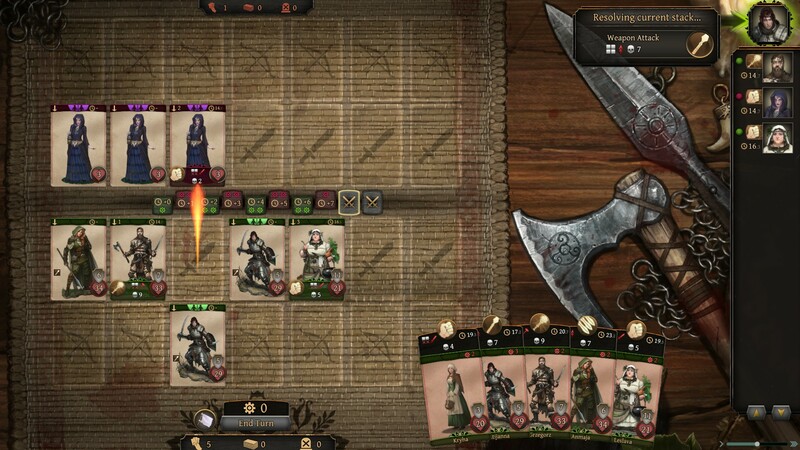 The battles are represented as card games, which are animated nicely, with great looking details on both the cards as well as on the playing field. The music is really beautiful. The soundtrack consists of a lot of different tunes for exploring and battles. The music is a bit folk-like medieval themed, and fits the game very well. The conversations aren’t narrated, but this doesn’t matter much, since the conversations are displayed more like a page of a book, so you won’t really notice it isn’t narrated. 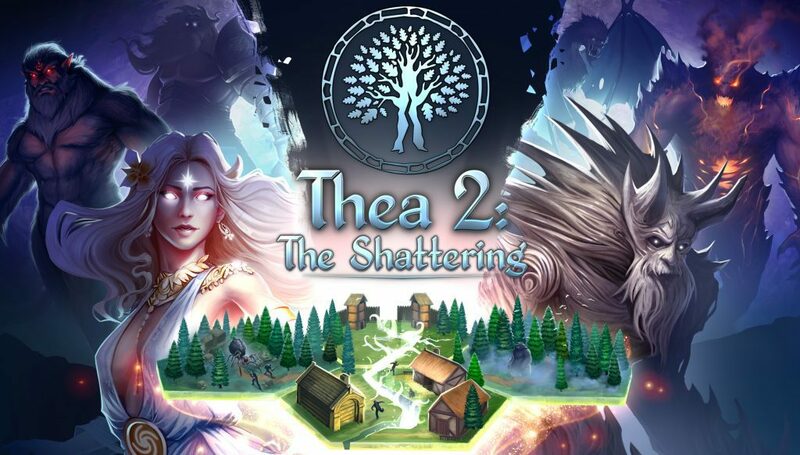 Thea 2: The Shattering is a combination of survival, RPG and 4X strategy. This is an interesting mix of genres, which works really well in this game. 4X stands for explore, expand, exploit, and exterminate, and this is exactly what you will be doing during this game. You’ll spend most of the time exploring the world around you, by walking a group of people around using a beautifully detailed isometric map. You can uncover resources by exploring, or encounter random events or enemies. If you find resources, you can gather them by putting up a camp, and assign tasks to the members of your group to gather resources or craft things. Gathering for one turn gives you a number of resources depending on the individual gathering skill of the characters, and crafting will take a few turns, depending on crafting skill. You’ll be able to unlock more craftable items as you play through the game. A random event or battle could happen at any turn. Random events can be something you’ve discovered such as a conversation, a battle, and sometimes even a birth. Battles you encounter are being played out by cards, each card representing a member of your group, or other groups if they are still nearby. Battles can be a traditional one where you fight creatures using your weapons and other equipment, but it can also be a battle of wits, where you can’t use your equipment, but only mental skills. Both are represented as a card game, with your team-mates as your cards, and random representations of the creatures or tasks as the enemy’s cards. First, there are several stages of deployment where you and your enemy put down your cards on the playing field, and assign the attacks and targets. Afterwards, the battle plays out and you see how well your attacks work. One team member’s card can be used multiple times for multiple attacks; it’s even possible to let only one team member perform all attacks in a fight. However, each attack of the enemy will hurt all instances of that team member’s card you have played (one card for each action), so that card will then be defeated very quickly. This might sound a bit confusing, but after about two battles you’ll surely get the hang of it. Each character can be equipped with gear, which you’ll find during random events, or which you have crafted. These items will help you in battle. Besides that, all characters have a unique set of skills and abilities, which you use in either physical or mental battles. All characters will level up as well, which lets you choose between skills for that character. If you have a child in your group, you’ll notice it will grow up in a number of turns, and then you’ll be able to choose a profession for that character; making it better at gathering, crafting or fighting. As you play, you’ll encounter a lot of random events. 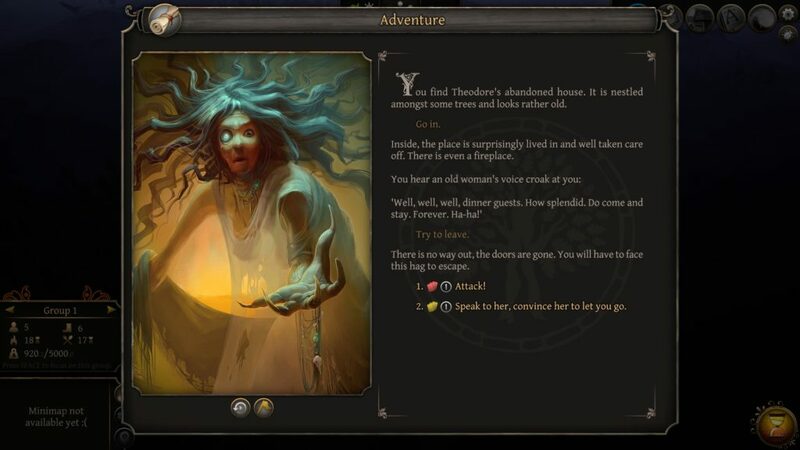 These might be an abandoned building, a demonic creature eating your food supply, a vision of the gods, a beehive full of scary bees, a pack of wolves, and many more… Usually, you’ll see a screen pop up with a beautiful drawing of the situation, and text explaining what’s happening to your group. Then you’ll be able to choose your action. Most likely, the conversational options let you choose between battle, fleeing, or confronting the situation in some other way. This element is a lot of fun, giving you a lot of control over your characters and their choices. These events also tell a lot about the setting and the type of dilemmas and creatures you are dealing with, which is very interesting to read. 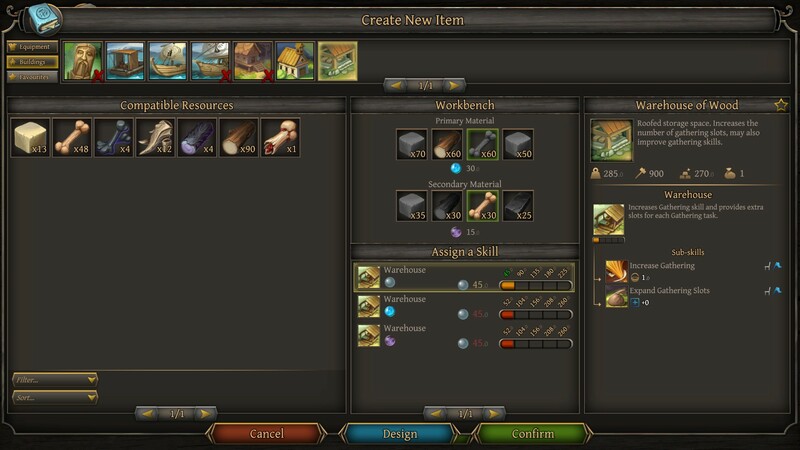 You’ll be able to build a village, which will present you with a lot more options: you can now create buildings and gain nice boosts with these (to crafting, resource gathering, experience, etc. ), but you’ll also have another location to defend and to stock with resources. At this moment you’ll quickly learn you can split your group up into multiple small groups, to explore and to defend a location. You’ll also notice the random events will come by much more often since they are triggered by separate groups. 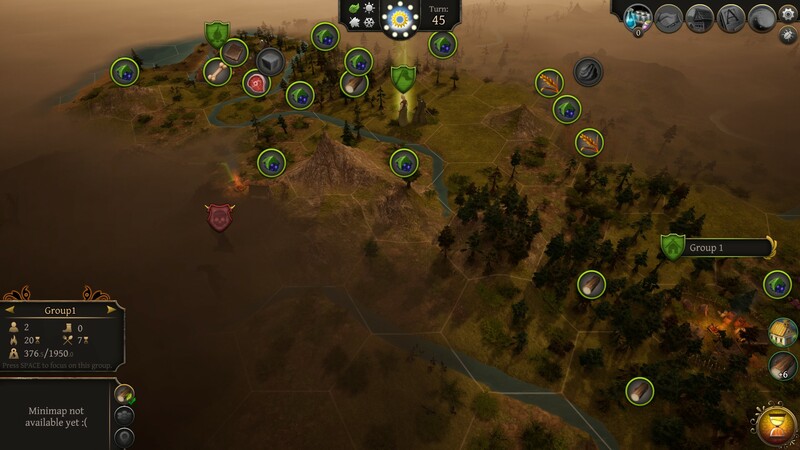 Splitting up exploring groups will also let you explore much more quickly, but you’ll also have to split up the resources to keep each team alive, and a battle is much more difficult to win with fewer team members. Thea 2: The Shattering is an interesting mix of genres, which works really well. The game feels rather overwhelming when you are just starting out, but you’ll quickly get the hang of it when you just start trying things, explore, and craft whatever you are able to. You’ll notice that the hours are flying by as you explore the world of Thea 2, and figure out what you can do in this game!